A finger has a long part and two short parts; in Greek, dactylos means "finger" or "toe". 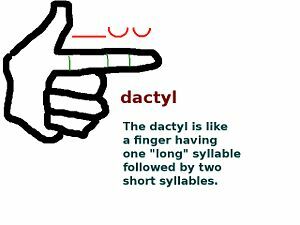 Dactyl is a term in epic poetry relating to the dactylic hexameter. It is from the Greek word dactylos meaning "finger" or "toe". A dactyl is a metron which resembles in its sound a finger, which has a long part, and then two short parts. Dactylic hexameter is also known as "heroic hexameter" is a form of meter in poetry or a rhythmic scheme. It is traditionally associated with classical epic poetry in both Greek and Latin and was considered to be the Grand Style of classical poetry. It is used in Homer's Iliad and Odyssey and Virgil's Aeneid. This page was last modified 02:26, 31 March 2010.